It’s beginning to look a lot like Christmas… Make spirits bright this December by kicking off your frosty festivities with a free or Premium digital invitation from Evite. Take your pick from more than 100 designs featuring Christmas colors, ornaments, and other festive elements. Whether you’re preparing for an annual holiday soiree, an ugly sweater party, a family dinner party, a charity event, or a casual gift exchange, our collection has designs to suit your style. 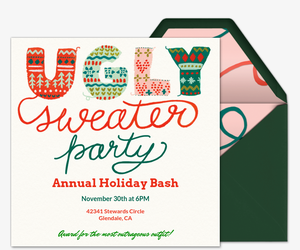 Planning a general holiday party? 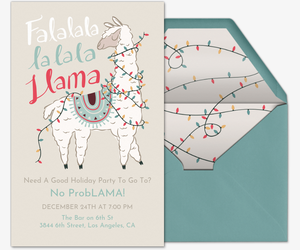 Browse our holiday party invitations. Holidays are made easy with Evite. Digital invitations let you track RSVPs, manage your guest list, post comments, share photos, and more all in one location -- or even on the go with our mobile app. 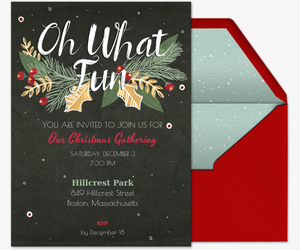 Plus, personalize your paperless invitation with a fun family photo using our upload-your-own invitation templates, or feature a pre-existing design using our design-your-own invitation templates. Then, spread the word about your event by posting your invitation’s shareable link on social media or sending it via text. Christmas comes but once a year, so go all out with Evite Premium. Our Premium invitation experiences are advertisement-free and include customizable envelopes, stamps, and photo and text cards. Pricing depends on the number of invitations you send. Deck the halls with creative Christmas party ideas from ideas.evite.com. Check out our holiday gift guides, budget-friendly hosting shortcuts, and seasonal party guides around cookie decorating, gift wrapping, movie nights, and more. 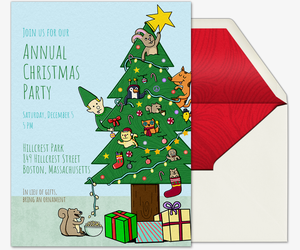 Browse the rest of our winter holiday invitations, or plan a Hanukkah, Kwanzaa, or New Year’s Eve party. Starting new traditions with the kids? Check out our Holiday for Kids collection. Or, plan a winter birthday party, baby shower, wedding or other milestone with Evite.